Pan card is an important identification proof and is used for various vital tasks like applying for a passport, new bank account, home loans and efiling of Income Tax returns etc. Thus losing a PAN card creates panic amongst most of us. But the reality is you need not worry if you have lost your PAN card. You can apply online for a duplicate PAN Card and get it issued in 15 to 20 days. What to do if PAN Card is lost? 1. Lodge a FIR for lost pan card: Firstly you should lodge a FIR at your nearest Police Station complaining them that you have lost your Pan Card. It is highly recommendable to lodge a complaint for a lost Pan Card so that you are not blamed for any consequences arising from misuse of lost pan card. 2. Retrieve the old PAN card number as you will require it for applying a duplicate PAN card. 3. Apply for a duplicate PAN Card online. 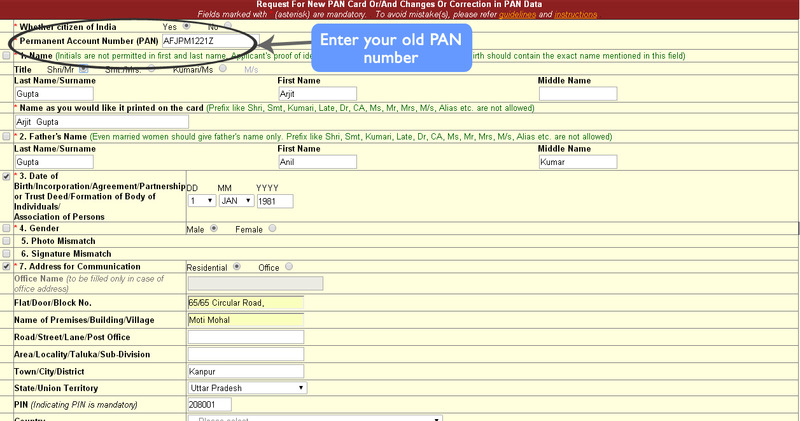 How to retrieve your PAN number in case the PAN Card is lost? 1. From a photocopy of the Pan Card lost. 3. You can also obtain your PAN card number from the Income Tax efiling site of the government at the Know Your PAN page. You can simply enter your name and Date of Birth details to get your PAN number. How to apply online for a duplicate PAN Card in case PAN card is lost? Step 1: Visit the NSDL site to apply online for a duplicate Pan Card. At the bottom of the web page select your status as Individual if you are applying it for a particular Person. Now an online pan card application form will open wherein you will be required to fill up the relevant personal details. 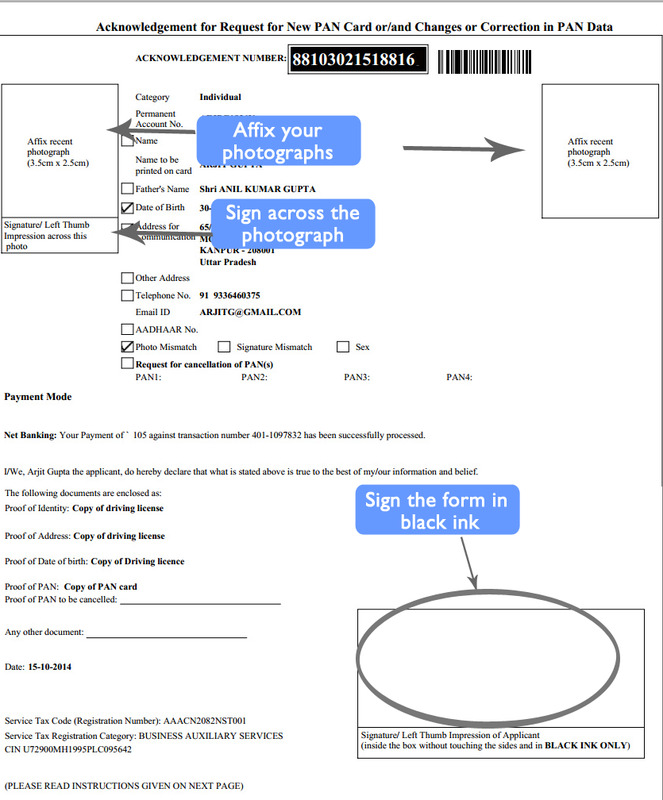 Step 2: Fill up the complete form details. At the very first step you will be asked for the old lost PAN card number. Enter the old PAN card number that you must have retrieved in one of the ways shown above. If you do not want to make any changes in the details of your PAN card and want it exactly like the old PAN card (lost PAN card), just fill in the compulsory fields and do not tick mark the checkboxes at the left side of the form (as shown in Figure 1 above). 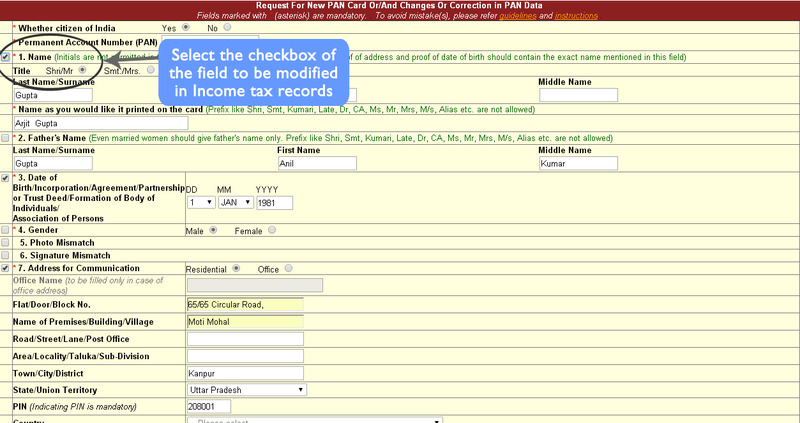 If you want to make some alterations in some fields then simply tick mark the checkbox of that field (as shown in Figure 2 below) and that particular field will be changed in the records of Income Tax Department. It is to be noted that your date of birth and Address for communication will get changed even if you don’t put a tick mark on that field. Step 3: Make payment for the PAN Card lost application form. At the end of the form choose the mode of payment of Government Fees of Rs. 105 as Credit Card / Debit Card / Net Banking if you wish to pay electronically and Press Submit button. Complete the payment procedure. If you do not wish to make online payment then you can send a Demand Draft of Rs. 105 at the address shown in Step 5. Step 4: Save the acknowledgement form. Save and Take a print out of the Acknowledgment generated after the successful payment of Government fees. Affix 2 recent photographs in the space provided in the acknowledgment ; one at the right hand side and the other left side. Do not staple the photographs. Sign across the photograph pasted at left side such that half of the sign should be on the photograph and half on the print out of the application. At the right hand side, sign in the box provided below the photograph. Ensure that the signature does not come outside the box. The acknowledgment form shall be duly signed at other relevant places of the form with black ink only (Refer Figure 3 below to see the acknowledgement form). Step 5: Courier the acknowledgement form to the NSDL office along with certain documents. Check the list of documents to be submitted along the acknowledgement form. Note: The envelope should be titled as 'APPLICATION FOR PAN CHANGE REQUEST-Acknowledgment Number' (e.g. 'APPLICATION FOR PAN CHANGE REQUEST-551010200000097'). The following documents should be attached along with the acknowledgement form of the duplicate PAN Card application. Proof of PAN. (A copy of lost PAN card). If you do not have a copy of the lost PAN card then the print of the receipt generated at Know Your PAN page will work. Documents supporting any changes in the details (like marriage certificate in case of change of surname). Copy of FIR filed for the PAN card lost. How long will it take to get a new PAN card? Normally you will receive your duplicate Pan Card in 25 to 30 days. To track your PAN Card status, check our complete guide on How to track PAN Card Status Online. MyTaxCafe.com helps you to File Income Tax Return Online for free.